BACKGROUND: Spotted knapweed, native to Europe, is thoroughly established in North America. In Idaho the weed is widely dispersed. Each plant produces up to 25,000 seeds that wind, animals, and people disperse. Seeds may remain viable for 8 years. DESCRIPTION: Spotted knapweed is a biennial or short-lived perennial. Mature plants may be 3 feet tall and are much branched. The weed forms a basal rosette the first year with leaves up to 6 inches long; both basal and stem leaves are pinnately divided. Flower heads are abundant, 1/2 inch wide, and solitary on branch tips. Flowers are pink to purple, or occasionally white, and appear from midsummer to fall. Each stiff flower head bract has a dark comblike fringe resembling a black spot at the tip. Seeds are dark brown to tan and are tipped by plumes that falloff at maturity. DISTRIBUTION: Spotted knapweed is found in the northeast and north central U.S. as well as along the Pacific Coast, most of Idaho, and east through Montana. CONTROL: Several biological control agents are available. A seed head moth and 2 seed head gall flies have been effective. 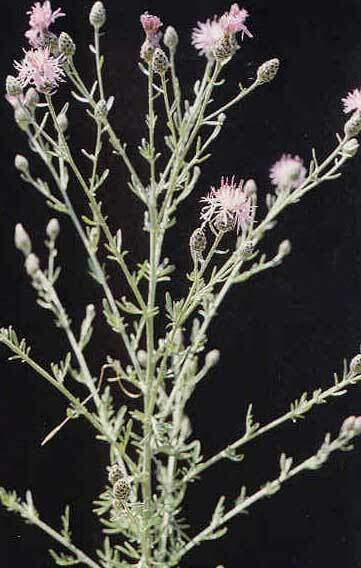 Herbicides are available for control of spotted knapweed.